Every Triumphisti asks this question in their life time, right? Maybe twice, maybe everyday? Recently, I was tempted with selling my Triumph TR6 (affectionally known as "Rags") to purchase a second-owner, 1962 Series 1 E-Type (known hereafter as XK-E). The Jag had been in storage for 17 years, and was essentially straight. It was in need of restoration, and if one could have lived with the dried-out oil seals that were now beginning to leak copious amounts of fluid, it could have made a fine driver. Having identified the cat as seeing light of day in May 1962, the car should have had flat-floors. Red-flag #1 as the car did not have flat floors. The original back-breaking seats had literally rotted away having sat in the sun for many years. The car had been fitted with a roll bar and what looked like vinyl-covered Series II seats. The vinyl covering was not standard as leather was used, so the pedigree of these seats was unknown. Another flag went up when I sat in the car - I didn't fit! My right knee had to be kinked at a 90 degree angle to reach the loud pedal, and so too was my clutch foot. Something was not right. Pulling the roll-bar and replacement seats and refitting the originals freed up about 3" of leg room, but this was not a comfortable driving position. At 6' with a 34" inseam, I thought I should have fit easily. Nevertheless, I persevered, and asked Randy Zoller to have a look at it. We took it for a drive and the car drove, steered and stopped well, albeit synchro on second in the old Moss box was shot. Another red flag. Yet the drive was worth it! Looking out along that gorgeous hood past the thin chromed rail at the top of the screen was awesome. The cackle from the exhaust would turn into a raucous snarl above 3000 rpm, and the big cat would leap forward with gentle prodding of the loud pedal in a manner that only a V8 could emulate. The car seemed to handle reasonably well, and Randy assured me that it braked pretty well, which was not a compliment often endowed upon the early XK-Es. Although we decided that the price of $25K was good, after a few agonizing days, I had to walk away from it. Now the big questions is "why?". 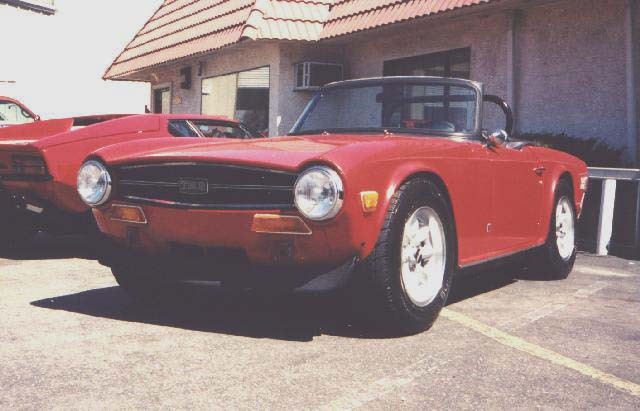 Why would I sell the TR6 in favour of a Big Cat roadster? The reasons for wanting the XK-E over the TR6, other than the shape of the XK-E, were simple. Horsepower. 2.5 liters in the TR6 just doesn't turn my crank. I recognize that the rather docile federalized Triumph motor can be coaxed to provide some entertainment, but the old adage "there is no substitute for cubic capacity" holds true. 3.8 liters of double-overhead cam six in the Jag looks just beaut, thank you very much. As I do most of the work on cars myself, a vital ingredient in the decision-making process is accessibility and ease of working on the car. With the help of Randy and several other XK-E-experienced mechanics, I soon learned that the XK-E is a tremendously complex car of almost evil proportions. What should be simple jobs such as rear-end maintenance or removing an engine/gearbox are major tasks. Perhaps by modern standards the car is not complex, but coming from the simple TR6, I figured that I would probably be spending more time under the XK-E rather than driving it! Then I started perusing the parts catalogs, checking for parts availability and prices. In general, parts are readily available for the XK-E, but quality of the reproduction pieces are unknown. XKs Unlimited in San Louis Obispo seem to be the best bunch around to deal with, but their prices range from 2-10 times more than for equivalent TR6 parts. Can you believe $4600 for a new hood? And there is perhaps one more thing. As a hotrodder, I am not not merely satisfied with originality. I seek to make my cars unique through the addition of high-performance modifications. This may gall purists, but as long as they stay out of my way, I shall not interfere with their enjoyment of our hobby. Jaguar enthusiasts are among the most myopic of all car "enthusiasts", and I have been told they take very poorly to outlaws in the mould of Carrol Shelby. For me, participation in a Club is part of the experience of enjoying a vintage car. But I will not tolerate snobbishness. So turning back to "Rags", sitting forlornly in the garage, a spurned lover, forgotten but momentarily, I realize that the TR6 is a mighty car, and perhaps best all-round for me. Its shape is still a head-turner, it is easy and inexpensive to work on, and the sound is almost like that of the XK-E. With a little work, it can be made to go as fast, corner and stop better than a stock XK-E. 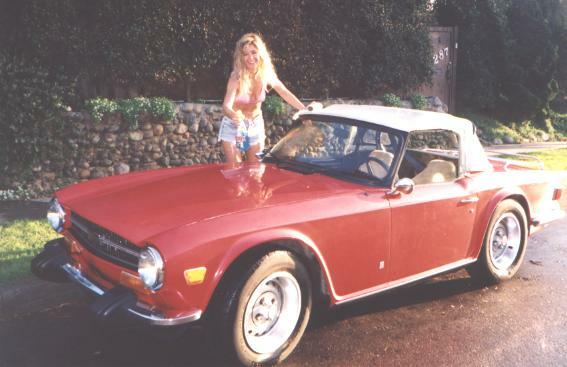 I truly believe, now, that the TR6 and I are wedded forever. "Why can't he be You". Last update: 8 May 1999.